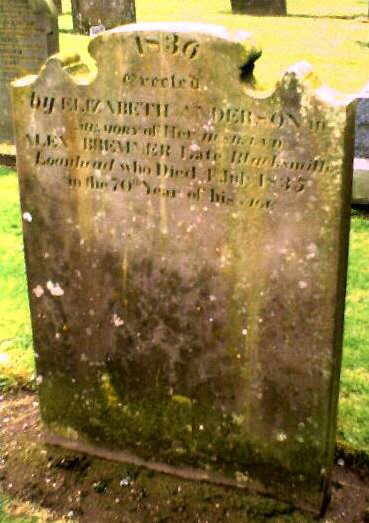 Monikie, Scotland - Kirkyard Memorial Inscriptions. As part of the year 2000 survey, indexing was carried out on a grid pattern - the first stone being in Row A (furthest west) and position 1 (furthest north), in the manner shown in the diagram. 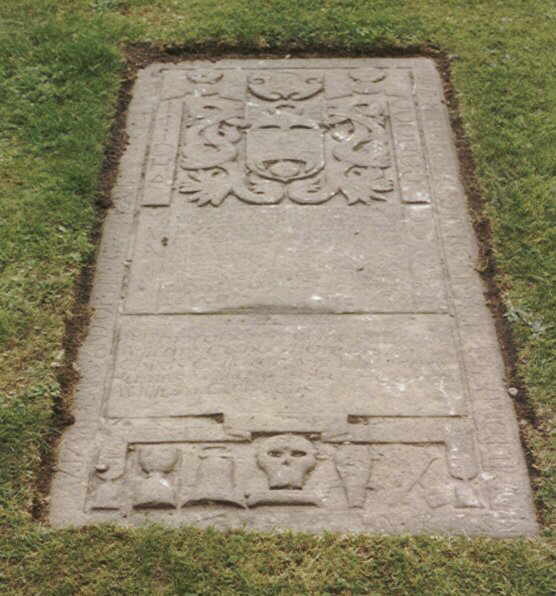 However, the stones in the kirkyard are not in their original positions and are not to be found in such a regimented grid pattern - read here what Rev. W. D. Chisholm has to say on the subject. * Various spellings may be used on the stones. * Not all persons named on the inscriptions are interred here. * Some stones have no inscription, or one which is still legible, but do appear in the survey list below. * Many of the names of persons, families and places mentioned on this page are mentioned elsewhere on this website. The best way to find them is by use of the Site Search Engine, but read the notes there first. An updated plan of the area around MONIKIE KIRK (some stone references shown) now also shows the lair numbers for the first kirkyard extension. 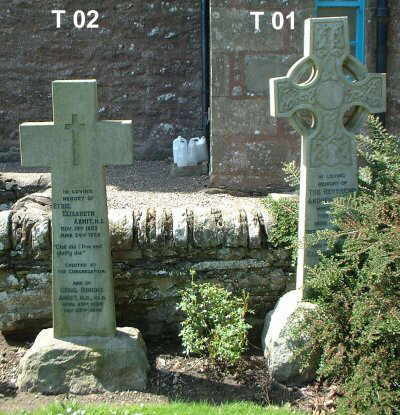 Please note that the numbers are those used by Angus Council who maintain the kirkyard. August 2002. The memorial inscriptions and photographs for the stones of the First Extension are now available HERE. CLICK HERE TO WATCH THE 'MOVIE'! 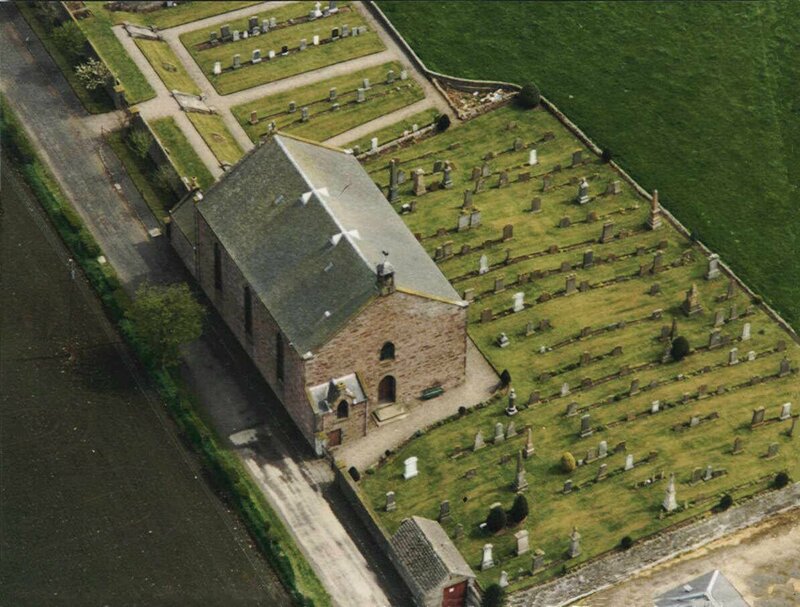 An large aerial photograph of the Kirk and most of the old kirkyard and first extension. 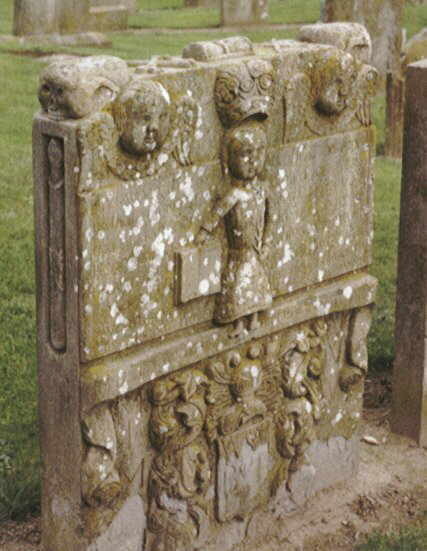 Taken before 1994 when concealed stones were 'discovered'. Many old inscriptions are so difficult to read in many instances that two persons might not agree on the original inscription. Although reasonable effort was made to accurately gather and reproduce the information here, it is the responsibility of the researcher to confirm the information. In order to assist researchers, in some cases the Old Parish Records and other sources have been inspected to help clarify or add some detail, or complete some missing information - the data includes mortcloth and marriage/banns records - such additional or alternative information is in red type. Researchers will know that spellings can cause problems when looking for a name, or a place. As an alternative to using the following alphabetic SURNAME list you may wish to use your browser's FIND (not SEARCH) facility - CTRL+F in MS Internet Explorer - and look for only PART of a name. As a last resort you can read through the whole inscriptions list shown below. 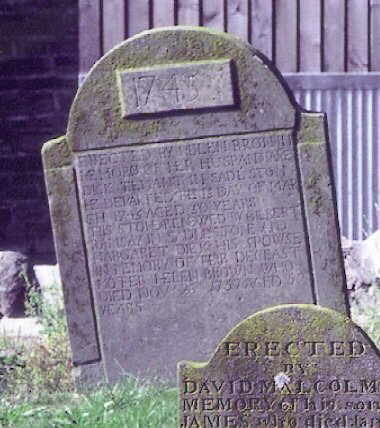 Read HERE about the stones in the Kirkyard, and the recording of the inscriptions. More name lists and information about deaths and burials at Monikie. You may wish to reflect on these few poignant words - 'Dear Ancestor', 'Census Taker', 'Of life', and 'A Letter from Heaven'. 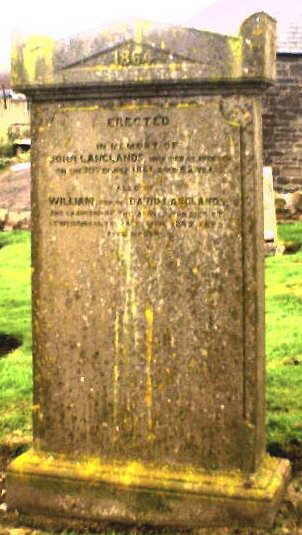 If you find any bad links in this webpage, or errors in any information shown - or can you add to these lists or references, from your personal viewing of the inscriptions in the kirkyard, or from your own family records - please advise the webmaster. It is the ideal that this webpage continues to develop in content, over time, with the aid of subscribers to build a complete list of all relevant information. 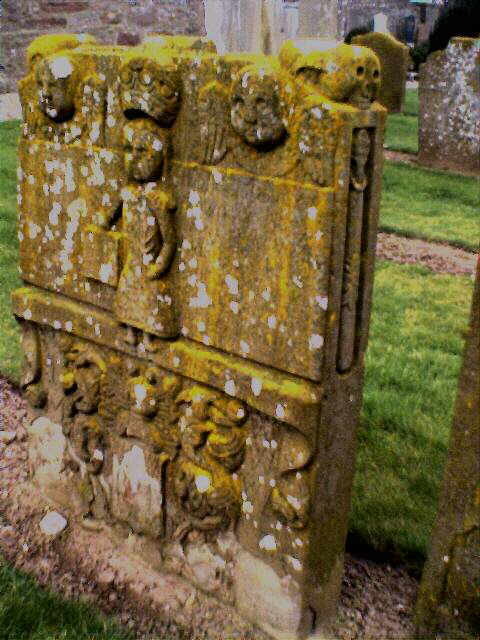 If YOU can contribute in any way to making this page the authoritative source of information regarding the stones at Monikie Kirkyard your contribution would be very welcome, thank you. Repeat for effect :^) - Whether you are successful, or not, in finding an entry in the inscription list you are strongly recommended to use the website search engine to check for other matches of interest to you elsewhere on this website. Because of the differences in spellings over the years you should try searching for several variations which you may know - e.g. search GUILDY and GUILDIE; DOUNIE for DOWNIE; AFFLECK was formerly known as AUCHINLECK, etc! August 2002. The memorial inscriptions and photographs for the stones of the First Extension are available HERE. by Rev. W. Douglas Chisholm, MA. (Spelling may be different to what you expect. There are a few others listed below, not capable of indexing. Click here for maps to find your way to the MONIKIE area and the Kirkyard. 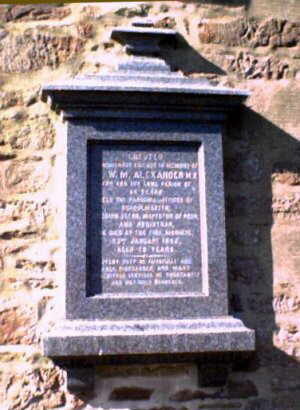 THE MEMORIAL INSCRIPTIONS AT MONIKIE KIRKYARD - OLD SECTION. North face In memory of JAMES SANDERSON Jnr chief engineer who died on the Red Sea 23 September 1876 aged 33 years also RICHARD SANDERSON of the Australian Navy who drowned at Melbourne 16 December 1877 aged 31 years MARY DYCE KENNY MBE MPS elder daughter of RICHARD and MARY SANDERSON who died in Malta on the 24 May 1981 she served with distinction in the Metropolitan Police and for 25 years as a probation officer in Kenya. 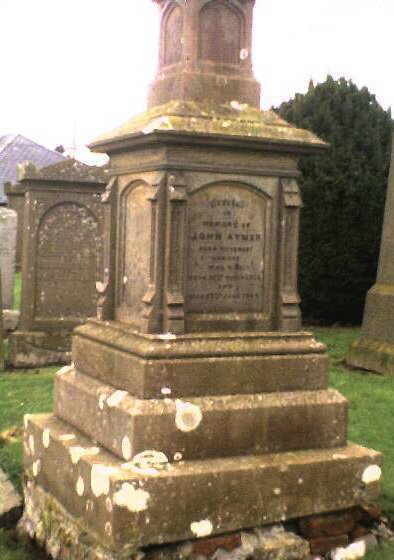 In affectionate remembrance of HELEN DODDS wife of PETER McINTYRE who died at Denfind died 15 June 1882 aged 38. 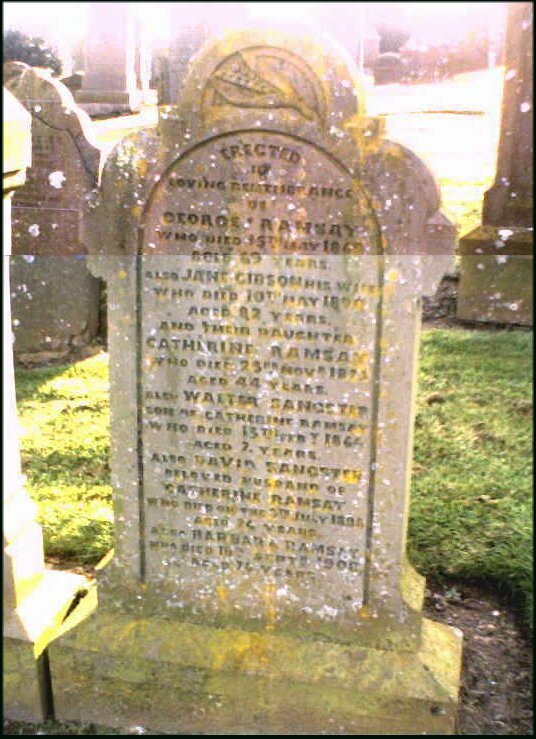 CAROLINE youngest daughter of GEORGE JOSEPH BELL AD 17 December 1859 BARBARA his second daughter AD 13 August 1863 (In circular cross, the words) "He giveth his beloved sleep." 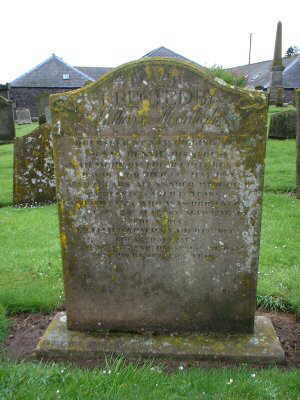 East face Erected by DAVID ALEXANDER and JANET SMITH his spouse in Cotton of Pitairlie in memory of their child DAVID died 10 February 1806 aged 2 years 7 months. 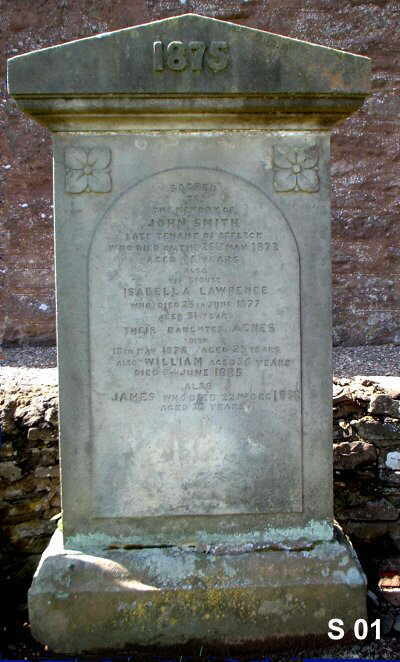 1769 This stone was erected by JANET BLAIR in memory of deceased husband JOHN RITCHIE late smith in Lonhead of Auchinlake who died 24 February 1760 aged 50 Blest with nine children. 1886 Erected by AGNES GIBSON in loving memory of FRANCIS NICOLL her husband who died 24 April 1885 aged 63 years the above AGNES GIBSON who died 3 March 1911 aged 84 years also their grandchild WILLIAM WALKER who died in infancy. In loving memory of CATHERINE ALEXANDER wife of GEORGE STEVEN East Hillhead Monikie died 11 February 1906 aged 45 their son JOHN STEVEN died 28 December 1909 aged 23 years GEORGE STEVEN who died 1 March 1941 aged 87. 1799. 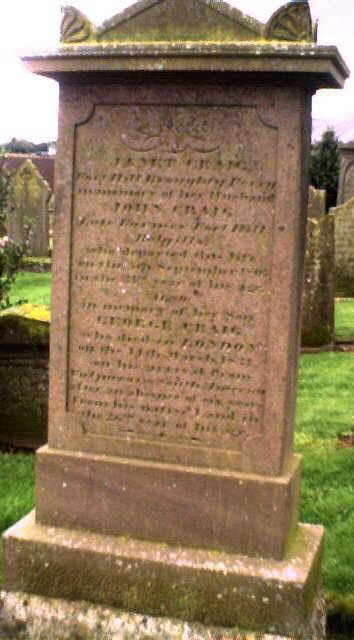 This stone revised by JAMES BROWN tenant in Westlands of Affleck in memory of his father ROBERT BROWN taylor in Craigton of Monikie died 1773 wife JANET MUDIE died 1769 their daughter JANET died 1783. (difficult to read). 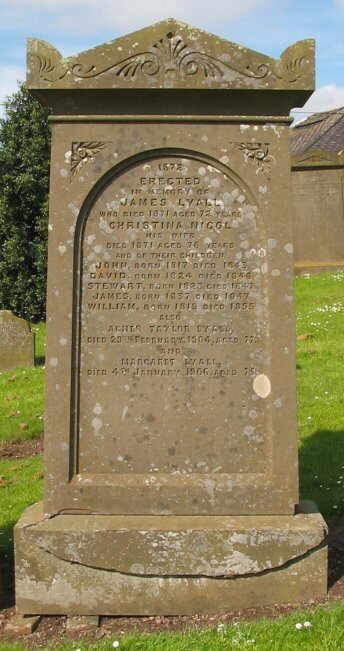 A descendant advises that the GRO(S) death record shows James Lyall, Snr. 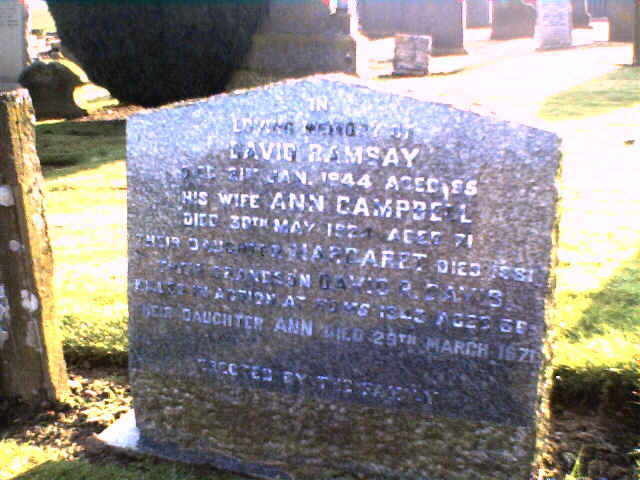 died 21 May 1862 aged 72 years at Braefoot Carnoustie. 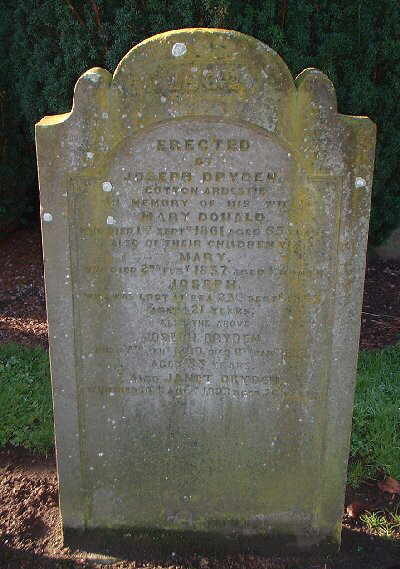 He was born 15 Feb 1790 at Miredyke, Inverkeilor. West side 1815 WB.+ MF. / WB. AB. IB. DB. IB. MB. CB. TB. EB. IB. BB. 1871 Erected by ISABEL STURROCK in memory of her husband JAMES BARRIE died 9 May 1871 aged 64 and their children ANN died 1 June 1841 aged 20 months DAVID died 16 January 1852 aged 17 the above ISABEL STURROCK died 2 April 1896 aged..
1777. Emblem AL. + MS. / AL. DL. BL. -L. (D)L. -L. AL. 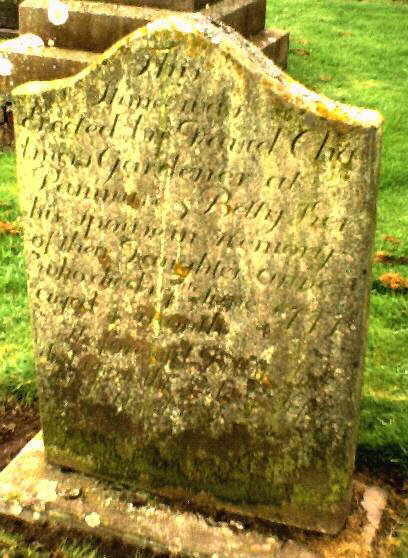 Erected by DAVID CUTHBERT tenant in Mill of Monikie in memory of his worthy wife LEUCRETIA JONSON May 1738 year and of her age 52 years. IC. IC. IC. DC. HC. AC. MC. WC. AC. IK. + ES. / HK. HK. IK. MK. BK. MK. BK. IK. (Possibly the oldest stone in the kirkyard: may have been formerly flat.) "JAS MVDE. 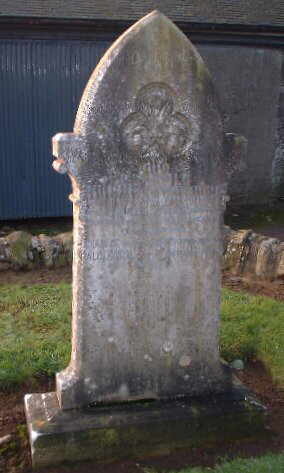 here lyes the forenamed honest man who died on the 17 of an 1656 a.d. of his age 80 a.d. his spouse 25 July 1660 age 98. (Partially covered by ground. Large lettering). 1756 ALEX ( Carie? ) 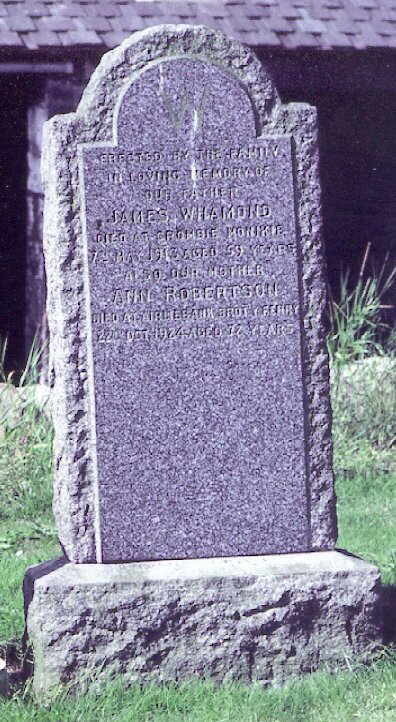 in Craigtoun died 1763? 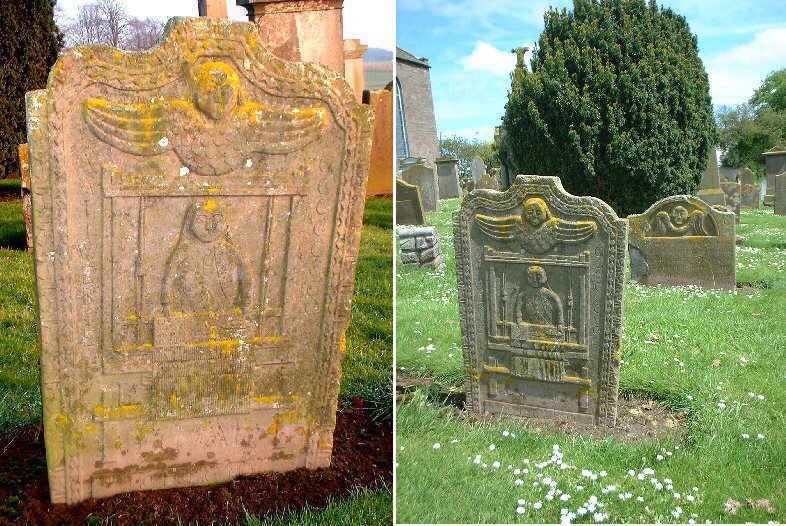 aged 67 and his wife ISOBEL MUDIE died 1741 aged 49 (Almost indecipherable) West side - emblem. "For as in Adam all die even so in Christ shall all be made alive"
". .that ye may . ." "And when the chief Shepherd shall appear ye shall receive a crown of glory that fadeth not away. <1 Peter V> Henceforth there is laid up for me a Crown of righteousness which the Lord, the righteous Judge, shall give me at that day; <II Timothy>"
". . his honour have . . at his . . "for . . . and unto . . j"
West side (fine carving - emblem of weaver) EH. IH. IH. IH. BH. IH. CH. Here lies ROBERT WAT husband to GREZAEL MELLMAKER who dwelt sometime in the Diktoun who departed this life upon the 14 day of January 1733 and of his age in the 52 year My glass is run and yours runneth fear to sin for judgement cometh emblem of a tailor. AND ANDERSON . . it . .ii . . Downie ISABEL STRACHAN his wife departed this life . . 1771 and of . .
(Perhaps oldest - formerly flat - difficult - emblem) AS MM MS Here lyes interred the corps of WILLIAM STIVEN husband to MA-- who departed ..
East face Here lies our fathers and mothers also our sister and two brothers who died ---- children ----. Emblem West side (Un-deciphered) WN. AN. EN. IN. AN. IN. CN. IN. NL. 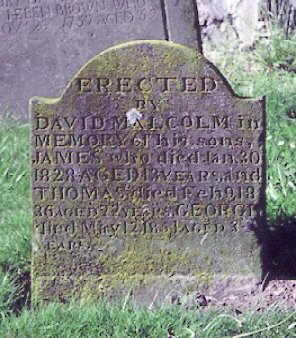 1828 Erected by DAVID MILL tenant in Seggiewell and his spouse MARGARET DEWAR in memory of their son DAVID who was killed by the overturning of his .. (Remainder of inscription below ground - but known to be his 'cart'). 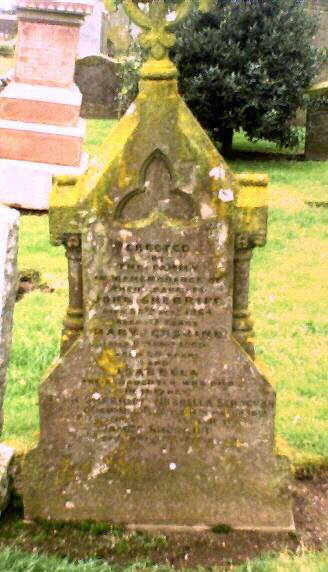 1810 Erected by GEORGE COOPER tenant in Craignathro the Parish of Forfar in memory of his spouse ANN CHISHOLM who died February 1806 aged 44 also . 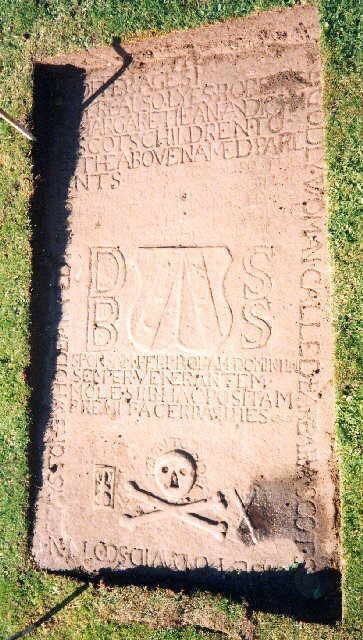 (Flat, very old, perhaps oldest - emblem two trumpets, lettering round edge) This stone erected by MARY STEPHEN and JAMES COUPER her son in ---- (verses around emblem, hard to decipher) 1648 ?, aged 63. East face This stone was erected by JOHN, GEORGE, JAMES and -- BROWN late tenant in ----, aged 64. 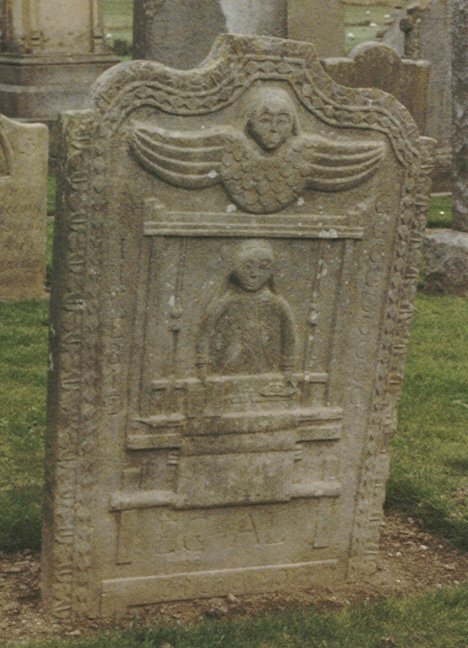 AGNES died 1771 and in memory of their deceased children. 1820 GG IB Erected by GEORGE GREIG late tenant in East Denside and ISOBEL BLACK his spouse in memory of their daughter ISOBEL who died in 1815 aged 19 years also of his sister JANE GREIG who died in ..
SGS refer to seven unseen stones, mentioned by Jervise; of these, 116 and 117 may both refer to the stone O06; that and another two flat stones, K05 and P06, were uncovered in 1994. 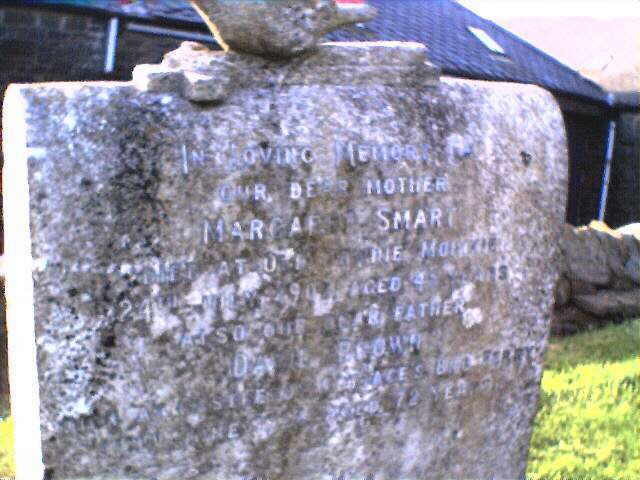 The 'unseen stones' are listed below with the curtailed inscription. SGS 112 - 1808 Erected by JAS DEMPSTER in Balbui(ng?) 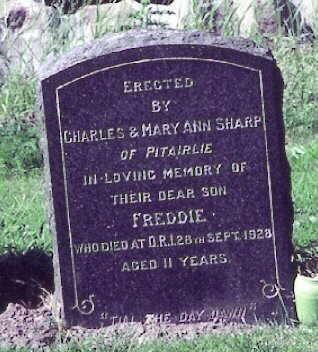 and his wife MARGT KID in memory of deceased relations viz. 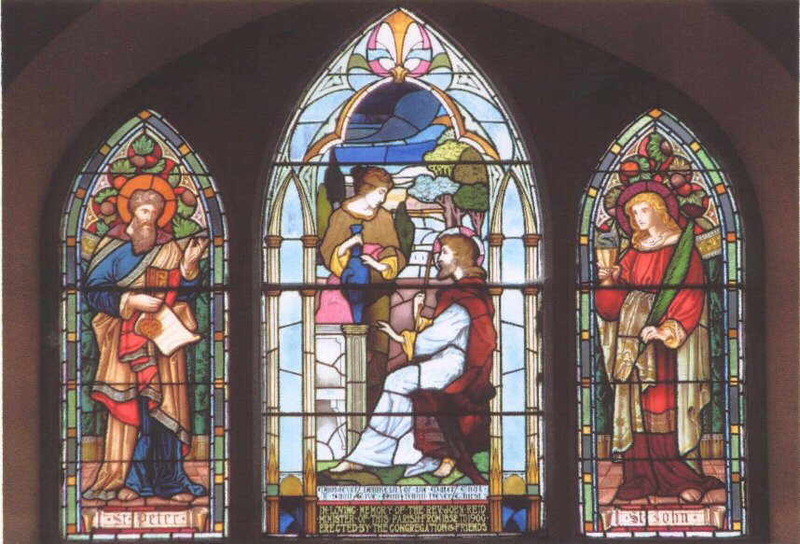 parents HENRY DEMPSTER died May 1782 after serving 41 years as schoolmaster in this parish, ANNA SIM died December 1787, brothers HENRY died June 1781 and JOHN died June 1789, sister ISABEL died February 1781, sister ANNA November died 1797, spouse ISOBEL PETRIE and child ISOBEL died March 1793 all interred here. SGS 113 - (but see M01 above) - JAS MITCHELL of Auchinleck died 31 October 18?? aged 50 years. Lieut. W.(G.) MITCHELL of HMS Esk mortally wounded while in command of HM gunboat Avon in the Waipa River, New Zealand on 3rd February 1864. March 2006 Can you identify these stones? 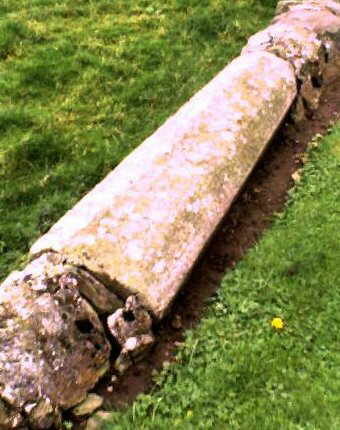 If you wish to contribute copyright-free photographs of any of the stones which do not already have a photograph linked above (or are better!) please notify the Webmaster stating very clearly the position reference number. Now use the website search engine to check for (more) entries for your ancestor. 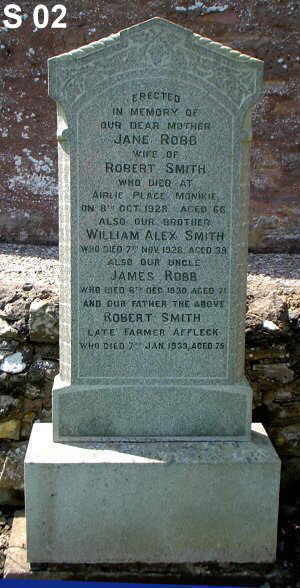 Copies of this information similar to this, in book form, will be available from TAY VALLEY FAMILY HISTORY SOCIETY. Thanks are extended to members of the society, and others, who have greatly assisted in this exercise, WDC, DBS, MN, AH et al. by following this link to this excellent Government website. A series of advice leaflets in PDF format.